Each week, Overlake Christian Church (OCC) in Redmond, WA is filled with a variety of events, as well as Christian services. The 5,000-seat sanctuary has been in operation for close to 20 years with an average weekly attendance of 3,500. With the largest seating capacity of any church facility in the Seattle metropolitan area, OCC recently installed a new NEXO STM line array system, the first to be installed in a house of worship in the United States. The STM replaces the existing system that was installed in the church when it originally opened. Morgan Sound of Lynnwood, WA, following a comprehensive study of the acoustical space and available rigging points, performed the system design and installation. 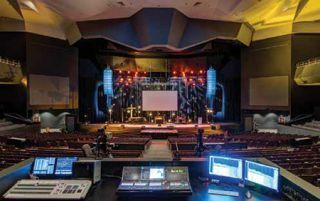 The Overlake Christian Church recently installed a new NEXO STM line array system, the first to be installed in a house of worship in the U.S. The worship at OCC is contemporary with a typical setup, consisting of seven to eight musicians and four to five additional vocalists. Because the space is large, it is also used for regional large-scale Christian concerts and conferences. The main STM system consists of 10 NEXO M46 mid-high modules coupled with 10 B112 low-frequency modules per cluster in a left + right configuration. Three NEXO M28 down-fill speakers per side are attached under the main arrays. Two each of a three-box NEXO GEO S1230 speaker cluster were installed for balcony outfill. Twelve NEXO S118 subwoofers are flown in the center of the church in cardioid mode to facilitate even subwoofer coverage throughout the whole space. The amplifier complement includes 13 NEXO NXAMP 4x4 and two each NXAMP 4x1 amplifiers for a total of 212,800 watts of power. All the amplifiers are connected via Dante for maximum flexibility. Morgan Sound also installed a Yamaha CL5 digital audio console at front of house and a second on stage in the monitor position. Two Rio3224-D input/output boxes are used as the snake system. With Dante networking, the CLs are routinely used for multi-track recording and virtual sound check. Dante also connects to a DM1000 with a Dante MY card in the broadcast booth for additional recording capability. “Dante is really an amazing tool and OCC is taking full advantage of it,” Weeks added.